Tuesday afternoon presented one of the most landmark moments in the history of the Mtn. Dew ATV Motocross National Championship, sanctioned by AMA (ATVMX), as the world's best four wheel off-road motorcycle racers took to the hallowed grounds of the Daytona International Speedway infield for the inaugural FLY Racing ATV Supercross (ATVSX). 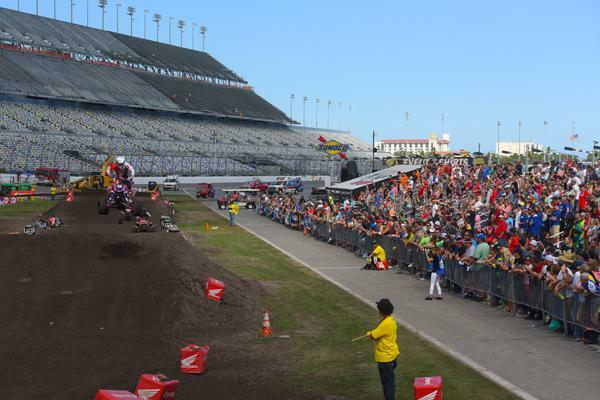 With the annual Daytona Bike Week in full swing, thousands of fans filled the infield grandstands to watch Baldwin Motorsports Honda's John Natalie post a wire-to-wire effort and take the first checkered flag at Daytona in his first race with one of the sport's most respected teams. With the ATVSX serving as the opening race of the 2015 ATVMX season, Natalie also seized early control of the AMA Pro ATV point standings. Florida native Jeffrey Rastrelli made the first statement of the afternoon in Daytona when he set the fastest lap of AMA Pro ATV practice aboard his JB Racing Can-Am. 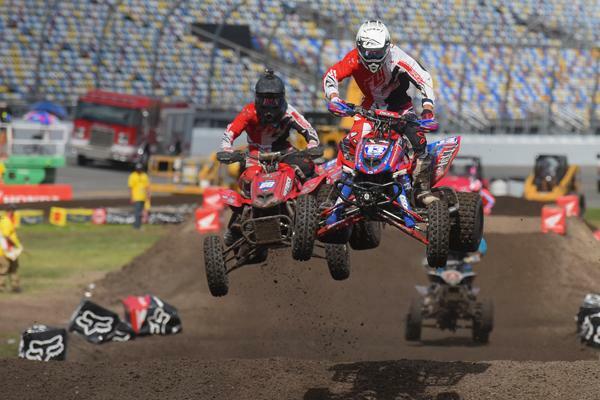 When the heat races got underway, Corrosion Specialties/Hetrick Racing Honda's Joel Hetrick and Natalie emerged with the wins, claiming the first ever ATV wins of any kind at Daytona. 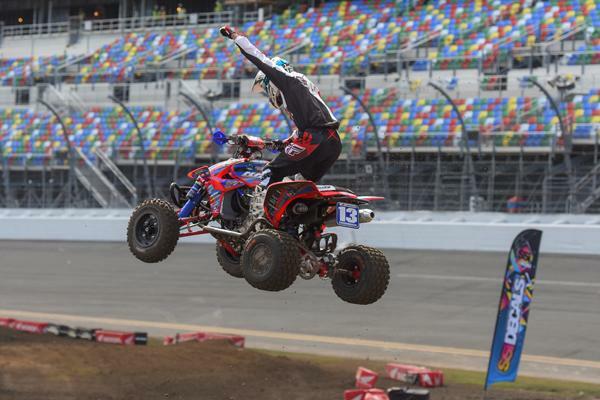 Fittingly enough, these two riders also took center stage in the AMA Pro ATV main event. 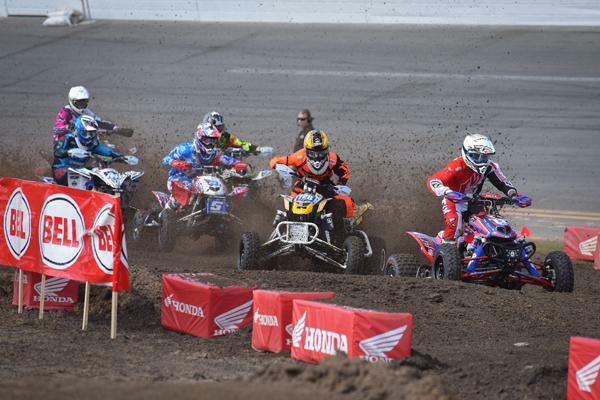 When the gate dropped on the first ever 15-lap ATVSX main event, the top 16 riders of the day barreled into the first turn at full speed. As the field navigated through the corner, Natalie came away with the lead and the Bell Helmets Holeshot, ahead of Rastrelli. Maxxis Yamaha, powered by Moto-Xperts, rider Thomas Brown was also in the mix, followed by Hetrick and Wienen Motorsports Yamaha's Chad Wienen, the reigning three-time series champion who needed to qualify for the main event via the last chance qualifier (LCQ). While Natalie was busy fending off the early pressure of Rastrelli, Brown encountered misfortune on the opening lap and crashed in a rhythm section, dropping to the tail end of the field. That allowed Hetrick and Wienen to move up a spot and set their sights on the leaders. It wasn't long before the top four riders became separated by just over two seconds, checking out on their competitors as they constantly battled the rough, deteriorating conditions that make Daytona one of the most iconic supercross races in the world. The gap between Natalie, Rastrelli, Hetrick and Wienen stayed consistent until just about the halfway point when Rastrelli came up short in a rhythm section and tipped over, eliminating him from competition. The gap that Natalie was able to open up on the field following Rastrelli's misfortune seemed like too much to overcome, but the intensity of the battle between Hetrick and Wienen for second brought them back to within striking distance. On Lap 10, Wienen made a run on Hetrick that allowed him to get alongside the Honda rider, but it wasn't enough to make the pass. Shortly thereafter, Hetrick stepped up his aggression to pull away from Wienen and begin a late charge on Natalie for the win. Lapped riders started to play a factor in the closing laps, but both Natalie and Hetrick navigated them perfectly. Just over a second separated the two riders as the last lap began and it was Hetrick's cue to let it all hang out. Last year's championship runner-up stayed on Natalie's rear fender until the final stretch run to the finish when he took an inside line and put a wheel inside Natalie. The veteran Natalie didn't flinch and held his line, forcing Hetrick to make a last ditch attempt in the final split-lane section leading to the finish line that came up short. The two riders crossed the line nose to tail, bringing the crowd to a standing ovation. Wienen followed just a couple seconds back in third. "I am extremely pumped right now. It's Daytona. This is the land of speed," exclaimed Natalie, who went winless in both 2013 and 2014, taking his most recent victory at the season finale of the 2012 season. "I'm standing in the same spot [Gatorade Victory Lane] as legends like Petty and Earnhardt, and I'm so honored to be able to share this space with them. I am the first one to ever win an ATV race at Daytona. Nothing will ever change that." Hetrick's runner-up finish was a great way to get his 2015 season underway, one in which he will spearhead his own racing effort. For Wienen it was a day of what could have been after he entered the afternoon as a favorite to take the victory. Nevertheless, to finish on the podium after racing through the LCQ provided some solace. "I definitely made it hard on myself and had to come from behind pretty much all day. I really just wanted to get into the main event," said Wienen, who is chasing a fourth consecutive title. "I just didn't have great starts, but it's motivated me because I didn't have it today. I'm not really happy with today but that's racing. We'll keep fighting and come back strong." Natalie holds a three-point lead over Hetrick in the AMA Pro ATV point standings, while Wienen sits third, five points back.